Alexander Arutiunian: Violin Concerto "Armenia 88"
Pēteris Vasks: Violin Concerto "Distant Light"
Mikhail Bronner: Violin Concerto "Heaven's Gates"
Levon Ambartsumian's ARCO Chamber Orchestra was founded in 1988 in Moscow, but when Ambartsumian came to the United States (specifically, to the University of Georgia's School of Music), ARCO followed him and became an international ensemble in the process. They have recorded several CDs for the Phoenix label. Their newest release contains violin concertos by three composers – still living – whose careers, like the performers', began in the former Soviet Union. The oldest of the three, Alexander Arutiunian was born in Armenia in 1920. His very approachable concerto is tonal and driven by melody. Musically, it is no more advanced than Khachaturian's work in this genre. (There are several passing resemblances between the two, although Arutiunian's concerto, while more eclectic, is unmistakably less spiced.) The composer wrote this work in response to the 1988 earthquakes in Armenia; a tragic mood, while sometimes present, is not allowed to dominate. Pēteris Vasks, a Latvian composer, attracted notice in the mid-1990s with a handful of CDs on the Conifer label. Musica dolorosa is his most famous work. This concerto was written around that time, and so it was not included on any of those Conifer CDs. It is nearly a half-hour in length, and is in a single movement. The ethereal but extreme opening is typical of Vasks: the soloist plays at the extreme top of his range, executing trills, harmonics, and other patterns that threaten to push the performance into inaudibility or some other disaster. This is what electronic music sounded like in the 1960s. Just when the listener thinks he has Vasks's number, however, Vasks writes a beautiful cantilena for the soloist, and the concerto takes on a new dimension. Like Kancheli (whom he admires), Vasks is a polystylist with a taste for the elegiac. This concerto is a long journey through many climes, but the listener cannot fail to stay with the composer because of the sincerity, imagination, and cool beauty present in his music. The CD leaves little room between Vasks's and Mikhail Bronner's concertos, and listeners not paying close attention might not realize the former has ended and the latter begun. 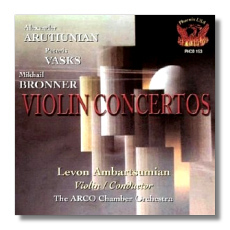 Bronner's concerto is just gorgeous, though – more effusive than the Vasks, more Romantic than the Arutiunian. I don't know anything about this composer beyond what Phoenix's notes tell me; it is worth noting that he studied with Khrennikov, and that he is inspired by Jewish history. This twenty-minute concerto is full of the morbid lyricism one hears in Prokofieff's Second Violin Concerto. One could follow many a worse example! The performances on this CD are capable but not outstanding. Ambartsumian doesn't bring enough color to his solo-playing, as he seems to be pre-occupied with the music's technical challenges. The ARCO Chamber Ensemble is similarly underpowered and under-inflected, although they have no trouble drowning out their founder in the louder passages of the Vasks. These balance problems have not been entirely resolved by engineer Douglas Moore. Otherwise, the sonics are good.